Last week M. and I climbed over the ridge to “Camera Trap Spring” (our personal name for it) to leave an offering to Tlaloc. Thing have changed a little bit since a year ago. The ground is black with ash. Stones have cracked from the heat of a forest fire. That ground-up bark on the ground is mulch dropped from a helicopter in mid-April. Mixed with grass seed, it is supposed to help the grass grow to hold the slope against erosion. For more about that re-seeding and our visit, see the other blog. The tiny spring is in the upper right quadrant of the photo. 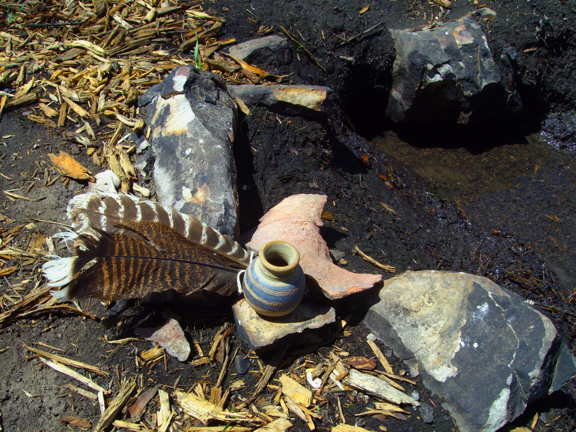 The little jar holds a liquid offering, while the turkey feathers are offered in lieu of a real turkey, which if I had been an old-time Nahuatl-speaker, might have been offered in lieu of a human child. In my personal practice, I care less about questions of authenticity, ethnicity, book-knowledge, or “the lore” than I do about the land. I think that I live at the fringe of the area in which Tlaloc (or Someone like him) was anciently honored; therefore, for the past two years, I have been trying myself to do so. This little seasonal spring is like a miniature version of the whole hydrological cycle. Rain and snow fall on the rocky ridge above it — the entire collection area is probably smaller than a football field. Then the spring flows, in direct proportion to the winter snows, until the water is all gone.Through evaporation, through the urine of bears and elk — however it goes — the water flows back into the cycle. This entry was posted in Uncategorized and tagged bioregion, Colorado, polytheism, Tlaloc, water by Chas S. Clifton. Bookmark the permalink. “In my personal practice, I care less about questions of authenticity, ethnicity, book-knowledge, or “the lore” THAN I DO ABOUT THE LAND.” (emphasis added). I’ve lived in NYC, Philadelphia, Miami, West Palm and now NE TN. In each of those areas, I have been acutely aware of the difference in the energy itself of the LAND. There’s something different in each place, like each area has it’s own frequency, it’s own vibration. I have often wondered if the real reason for different human cultures/ethnicities/ ways of doing things, is in response to this subtle, yet pervasive difference in the energy of the land itself. I live near the western-most ridge of the Appalachians. There is a major road that runs along the base going into the next town. Although the majority of the road runs along the valley formed by the river at the base of the mountain, at one point, there is a spur that comes down and the road needs to go up and over it. There is a noticeable difference in the energy on one side of the spur to the other side, and, as you’re going over the spur itself, the energy there is also very different from the two sides that the spur bisects. At the base of the spur is an archeological site which has been occupied for thousands of years and where Archaic Indian artefacts have been found. And again I wonder… why did humans settle on that particular site and not another further up or down the river where one could easily build a village on the flat riverbed land? What is it about the energy of that particular place that made it so agreeable? I also get giddy when someone uses the words “offering” & “hydrological cycle” in the same context — it makes me want to squeee like a piglet.